Relax in high-class ambience while perusing the award-winning wine list and extensive cheese and appetizer menu. The main course will be one of multiple beef and seafood selections from around the world, prepared by recognized Chef KC Fazel. You’ll be richly rewarded if you choose to finish the evening with a specialty coffee and an impressive dessert. Come to Tender Steak & Seafood & enjoy wine & cheese selections from their specialty menu or indulge in the cheese and scotch pairing. The large collection of cheeses is a particular source of pride for Chef Fazel. 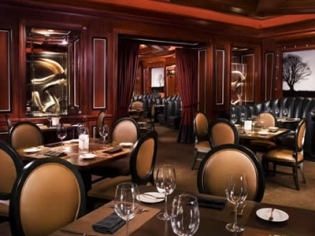 This restaurant has earned the Wine Spectator Award of Excellence for five consecutive years. A three course dinner and a show menu are available. I have had dinner here several times over the last few years and usually it’s better than okay but on 12/01/15 it was well below standard. My steak seemed to be about 50% fat. I sent it back and got a different cut which was somewhat better but still lacking. I did talk to a very nice Manager lady about it and she was very nice and very helpful. Very good food, it was wonderful! The service was also excellent! We come back!!! !